Lavender plants (Lavandula angustifolia or L. officinalis) are very popular herbs. Attractive, fragrant and functional, lavender is known to have a soothing effect on people when it is inhaled, according to information published by the University of Maryland Medical Center. Most cultivars of lavender average between 2 and 3 feet in height. Many have a pleasingly rounded shape, while others have a looser, more natural form. Lavender can also be grown very successfully in containers. Culture of this plant does not go beyond basic practices, making lavender a good choice for home gardeners who want a beautiful but hardy perennial. Place or plant your lavender in a location where it will receive a full day's worth of sunlight. This plant grows best in sunny, dry locations, according to information published by the University of Florida. Keep the soil pH level above 6.0. Anything below this level is too acidic for the lavender to fare well, suggests the University of Florida. Use a soil-testing kit (available at any garden center or nursery) to determine the pH level of your soil, and amend the soil with an application of lime to increase the pH level if needed. Water sparingly. These plants prefer conditions on the dry side. Overly wet soil can lead to root rot, a fungal disease that destroys the roots of the plant. Prune in the spring, before the blooms open. Cut away any dead wood, and shape the shrub according to your preferences. Cover the immediate area around your lavender bush with a thick layer of mulch in the fall. This will help protect the plant during the winter, recommends the University of Florida. 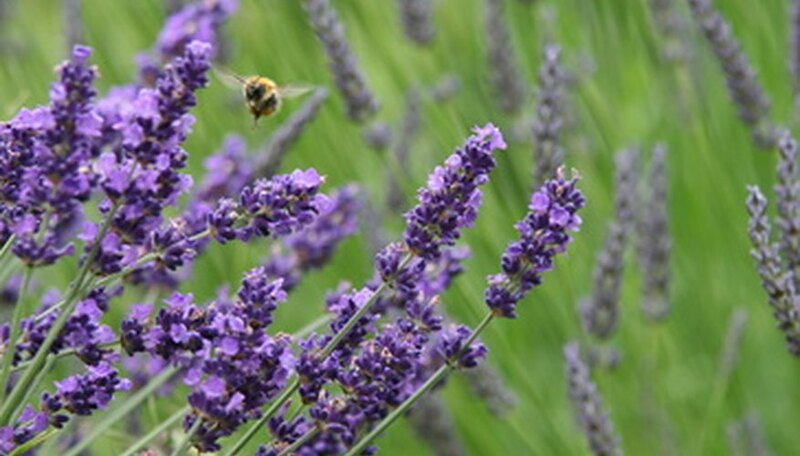 Lavender grows best in United States Department of Agriculture hardiness zones 5B through 8. Lavender flower spikes can be cut and hung upside down to dry. The more you cut, the more flowers will bloom.